The hype is up, up, and away! Hey, have you heard about today’s “Supermoon”? If you have, then chances are you’re heard a lot of hype about it being superclose and superbright and super, uh, super. But first, let me be clear: I always always urge people to go out and look at the Moon! It’s beautiful and fascinating and wondrous. If you can, use binoculars or a small telescope to get an even closer look; it’s an entire world hanging in the sky so there’s a lot to explore. Craters, impact sites, mountains, and more … it’s simply awe-inspiring. But I want your sense of awe to be honest, and honestly stoked. 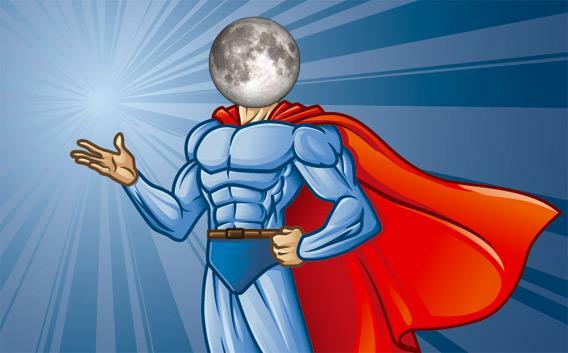 This Supermoon stuff isn’t the right way to do it. So what’s a “Supermoon”? It’s not a real astronomical term—it was actually coined by an astrologer, so don’t even get me started here—but in the popular vernacular it’s when there’s a full Moon within a few hours of the Moon being closest to Earth. The Moon orbits the Earth on an elliptical path, so sometimes it’s closer to us than other times. Monday, the Moon reached its closest point to Earth (called perigee) at approximately 11:20 UTC (06:20 Eastern U.S. time†) when the center of the Moon was just a hair under 356,508 kilometers from the center of the Earth (astronomers like to use the centers of objects to measure distances, to avoid messy circumstances like nonspherical surfaces). As the Moon orbits the Earth, its phase (the amount of lit surface we see) changes. When it’s near the Sun in the sky we see it’s dark, unilluminated side facing us, so we say it’s new. Two weeks later it’s opposite the Sun in the sky, and we see it fully illuminated, and we say it’s full. 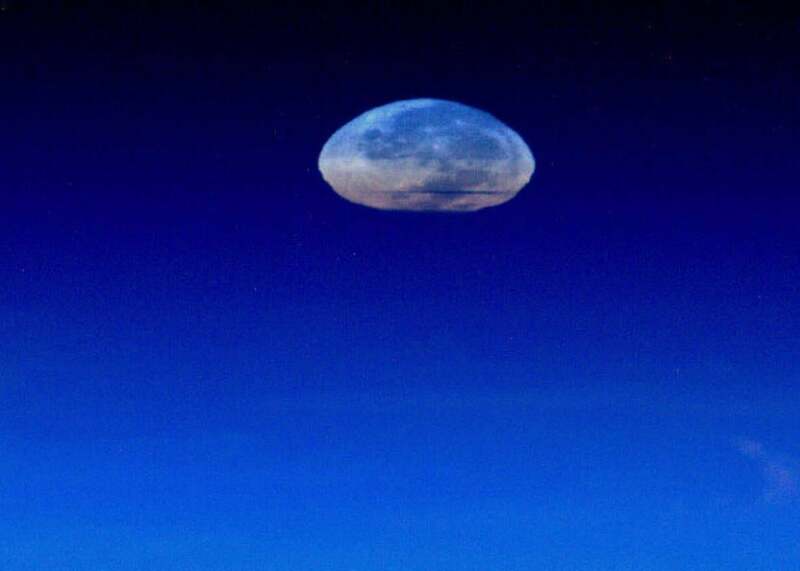 Deflating the Supermoon: An actual photo of the Moon from the International Space Station, its appearance distorted through our atmosphere. Click for more info. On average, the Moon’s perigee distance is roughly 360,000 km from Earth. Also on average, it’s about 405,000 km away at its most distant point (called apogee). That’s about a 10 percent difference. That in turn means the Moon looks about 10 percent bigger when it’s at perigee than at apogee. That’s not much! And those are the extremes, too. If you’re an experienced lunar observer you might notice that difference, but for an average person I’d expect you wouldn’t be able to tell just by looking. The Moon is pretty small on the sky, far smaller than you think. Let me ask you this: If you held up a dime, how far away from your eyes would it have to be to appear the same size as the Moon? Here’s the answer, and it may surprise you. The point? A 10 percent change in size isn’t a big deal (and be careful not to be confused about the famous Moon Illusion, when the Moon looks bigger when it’s on the horizon; that really is an illusion, and happens whether the Moon is near perigee or not). It gets worse. Monday’s “Supermoon” is supposed to be closer to Earth than it has been for decades. That may be true, but by how much? The last time a full Moon was this close was on Jan. 26, 1948, when it was 356,462 kilometers away. That’s a difference of just 45 kilometers or so closer than it was Monday! Remember, this is the distance between the Earth’s and Moon’s centers … and the Earth is nearly 13,000 kilometers across! So this small difference in records is completely wiped out by the simple fact that someone standing on a different part of the Earth might be thousands of kilometers closer or farther from the Moon. That’s why I don’t particularly care for glorifying “records” in cases like these. It may be true numerically, but in practical terms it doesn’t make any real difference. Another Supermoon claim is how bright it’ll be, too. It’s true that an object closer to you will appear brighter, and it’s a strong effect. In the end the Moon will be about 20-30 percent brighter than a usual full Moon. That may be enough to notice, but atmospheric conditions (clouds and haze) could easily affect that, and it’s hard for people to simply compare one full Moon to another, because you have to remember how bright it was last time, a month ago, and that’s hard to do. I’m not saying you won’t notice! But the hype makes it seem like the Moon will be vastly brighter; a powerful orb searing the heavens. In reality, the full Moon is pretty bright anyway. If you notice the difference, terrific! But always be a little bit skeptical. All in all, stuff like this “Supermoon” makes me conflicted. I love the idea that people will hear about it, go outside, and take a look at our nearest cosmic neighbor … especially if they otherwise wouldn’t. Getting people to go out and look up is a good contender for my Astronomical Prime Directive. But I think they should be armed with the facts when they do, and be doing it for the right reasons. The right reasons are that the Moon is gorgeous, ever-changing, and honestly really fun to observe. Those are, in my opinion, the reasons you should go out and see it. Either way: Go out and look up. Watch the Moon! When you do, you’ll realize it’s always super. *Note that both these times are during the day for the U.S. That’s OK; if you saw the Moon on Sunday night or wait until Monday night it’ll still look full, and still be near perigee. It rises around 5 p.m. to 5:30 p.m. local time for you (it depends a bit on where you are in your time zone; check your local listing). † Correction, Nov. 14, 2016: I originally wrote that 11:20 UTC was 07:20 Eastern time.